You already know the Nokia Lumia 900 and HTC Titan II are now available through AT&T in the United States, now it’s April 9th and Microsoft has revealed what that free time machine mystery was all about. Microsoft is now giving away something we can all get some use out of and never seem to have enough of: time. How is Microsoft doing this you ask? As originally advertised on the free time machine page, Free-Time Machines were installed in New York, San Francisco, and Chicago. They operated with a good turnout from 8 AM to 6 PM local time today. The Free-Time Machines gave out instead prizes in the form of ATM style machines. The ATM style machines would spit out prizes that would save you time, free grocery deliveries, cleaning and dog-walking services, and access to personal concierges. 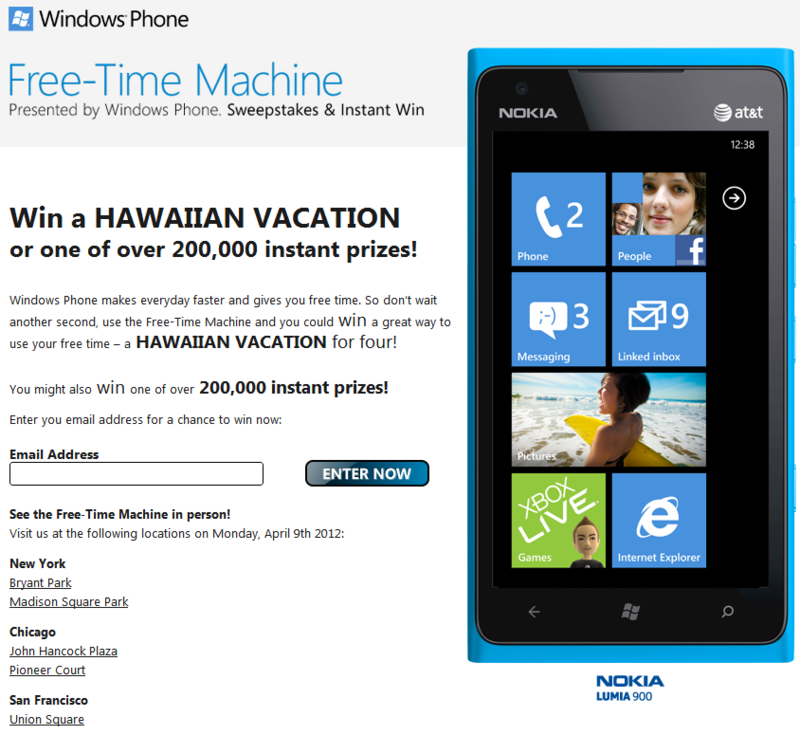 Even a Windows Phone was thrown in the instant win prize selection! Now, with only three cities participating that left most of the United States Windows Phone world disappointed in Microsoft and Nokia for poor city selections. But wait, there’s more! The real free-time machines definitely exist over at the now available www.freetimemachine.com page. What’s in it for you? Available to all U.S. residents 18 years and older, you can enter daily over at the page to instantly win prizes such as free ringtones, Microsoft Points, Zune passes, and more! A total of over 200,000 instant win prizes available. When the entire promotion is over, you will have also been entered to win a grand prize trip to Hawaii for you and three guests. Sweepstakes ends 5/31/12. Remember to get into that free time machine each and every day! Thanks for sharing. It’s coming and let see how it responds. didn’t even doubt that it was US only..